Prof Rury Holman is the recipient of the 2018 Outstanding Achievement in Clinical Diabetes Research Award by the American Diabetes Association. This award recognizes exceptional contributions in patient-oriented or clinical outcomes research that have had a significant impact on diabetes prevention and treatment. Rury has delivered landmark clinical outcome trials for more than four decades and is considered an exemplary clinical scientist and global leader in the field of diabetes. 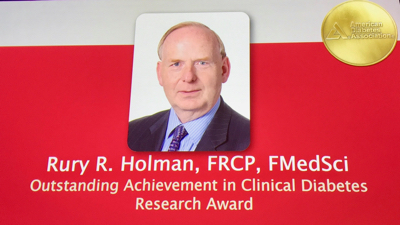 "I would like to congratulate Prof Holman and humbly thank him for his remarkable research contributions, which have shaped the way we approach diabetes care and informed evidence-based strategies to prevent and treat diabetes," said the ADA's 2018 President of Medicine and Science Jane E.B. Reusch, MD. "Prof Holman's work has led to crucial advancements in diabetes treatment and touched millions of lives in the process." * Directing the 10-year UKPDS post-trial monitoring program that identified the glucose "legacy effect", which led guidelines worldwide to recommend targeting optimal blood glucose control immediately upon diagnosis of diabetes.